Enable external, hot-swap access to 2.5in SATA drives from a portable mini USB2.0 drive dock. 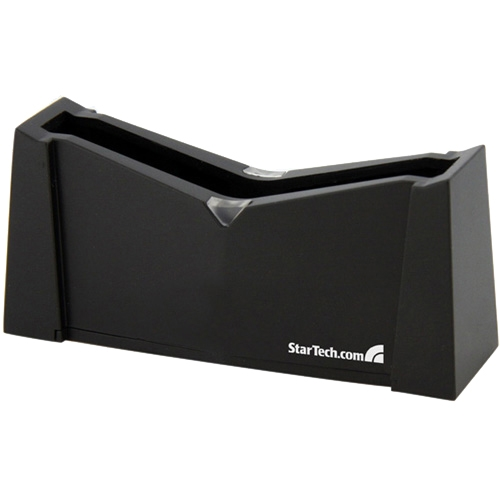 The SATDOCK25U Hard Drive Docking Station provides full, instant access to any 2.5in SATA (SATA, SATA II, SATA III) hard drive or solid state drive - without having to mount the hard drive in a computer or install it in an enclosure! This highly compact HDD dock offers the portability needed to add simple external storage to virtually any USB-capable computer, making it a definite asset to have on hand to connect external (bare) hard drives even in mobile computing applications. Plus, it''s small form factor design requires minimal space on a desktop or work bench. Large capacity drives (tested with up to 1TB) can be used to greatly enhance your computer''s storage/backup capabilities. Simply insert a 2.5in SATA hard drive or SSD into the dock, then connect the hard drive dock to a host computer through USB 2.0. To uninstall or swap the hard drive, simply disconnect the USB cable and remove the drive from the dock!